Arrow Digital has recently launched a new Machine to their ever growing product portfolio. The Arrow Label Press 216, an In-House Digital label printer for Short run jobs. Customers have the flexibility to test run the benefits of the digital roll fed label printer at Arrow’s R&D Centre in Ahmedabad. At the demo centre, customers have the freedom to test print samples and gain hands-on experience of the machine. 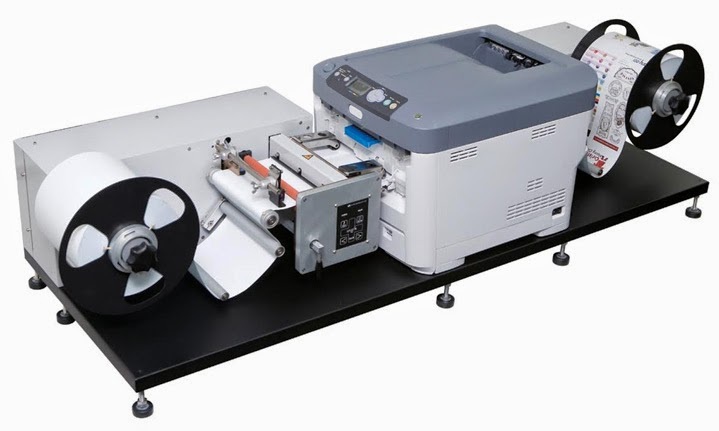 The Arrow label press 216, running at 9.3 meters a minute, is a desktop-sized digital roll label printer using a single-pass LED color laser engine. The system focuses on precise registration: the web station is designed for precise control of exact registration (± 0.3mm width-direction variance) with supporting gap sensors and black mark sensors. This enables the printer to support any pre-cut labels and post-processing of rotary die-cutters. The Arrow Label press uses its own software and thereby conveniently and speedily processes the tasks that were impossible with analogue equipment. The Unique and Variable data that is entered into labels, such as QR codes, barcodes and numbering can be printed out immediately. Labels, of sizes up to 20.5-120 cm can be printed on various media such as art papers, certified PET, Gold/silver paper, Teslin etc. This Label Press is an ideal in-house solution for companies in various segments like Pharmaceuticals, Food & Beverages, FMCG, Healthcare, Cosmetics, Home appliances etc. Along with the Digital Label Printer, Arrow has also launched a Label finisher - making it the complete label finishing system. This is the start to many new and exciting products in the Arrow family. Arrow Digital, with our decades of experience and knowledge of packaging, coatings, labelling, and most importantly Inkjets in general; gives you a partner unparalleled in this industry. Arrow/Grace paper are the pioneers in India and one of the first to manufacture self-adhesive materials in the 1970s. We know labels, labelling and packaging; and now Arrow is the leader in digital printing technologies in various segments – with a multi crore facility for trials, R&D and hands on training in Ahmedabad and offices in all major metros – we are here 24/7/365 to support our customers. In today’s market situation; creating new and saving existing good customers is the key to future success and growth.